Do you want your marketing to generate more leads? Of course you do. No matter how many you’re getting you always want more. You could crank up your spending, send out more mail, increase your pay-per-click budget, take out more ad space. Or, you could be smart. One thing that hasn’t changed in real estate is the power of signs. Really. I talked with a broker the other day who complained that she got no leads from her website. We talked around the problem for awhile and I finally asked how many listings she had. ‘Three,’ she said. Three listings = three signs. She’s unknown in her marketplace . . . and that’s why her website doesn’t draw. The first part of your carefully created marketing plan needs to address how you’re going to establish your presence in your target area by becoming visible (read: by getting as many signs as possible out). So you only have three listings. You know that Open Houses create an opportunity to use 4, 5, 6, or even more directional signs. But how many open houses can you personally hold on a Sunday afternoon? One, right? That’s one of the great things about Help-U-Sell. We have this concept of seller participation and a willing and properly prepared seller can hold his or her own open house whenever they want. If you got all three of your sellers to be open at the same time on the same day, that’s 18, 19, 20 signs in the marketplace (maybe more), and you’re making your presence known. Directional signs are not just for Open House day, though. They are powerful in the everyday world too. You must investigate local law and restrictions and then plan your directionals around them. However, I know of a number of offices in areas where directionals are prohibited who put them out Friday evening (after the enforcers leave work for the weekend) and pick them up Sunday evening. We even have one South African office that has a budget for monthly sign fines! They know they’re going to be cited, but the value of having signs in the marketplace far exceeds the cost of the fines. To them, the fine is just a marketing expense! Signs don’t always have to be stuck in the ground or tacked to a post. A car wrap is a wonderful sign with the added benefit that it’s mobile. I’ve known many brokers who encountered restrictions that affected the effectiveness of their office signage, who used a wrapped vehicle, parked at the street, to build their presence in the marketplace. And you don’t have to stop with a wrapped vehicle, either. Magnetic car signs, in your colors with your logo are available and easily attach (and detatch) from the side panels of your car. Finally, keep an eye out for community events and sponsorships that give you an opportunity to put your brand in play. The perfect example is the softball team to which you donate jerseys with your logo on the back. Hey: it works for race car drivers and basketball players, why not with the kids in your target market? Being visible in your marketplace, laying down a big, thick blanket of branding that people can’t help but notice, will make every bit of marketing you do . . . more effective. Your ads will pull more, your mailers will get a better response, your website will get more hits. And you don’t have to have dozens of listings to do this. Help-U-Sell starts with a premise: we are a marketing company. That’s a heavy concept and it’s pretty rare in today’s traditional real estate world where ‘marketing’ (read: advertising) is done largely by agents (not brokers) and done individually, one house at a time. It usually goes like this: the agent gets a listing, promises all kinds of ‘advertising’ and then scrambles to do it in such a way that the impatient seller is placated. The result is disconnected stuff all over the place, little coordination and little evaluation. Marketing companies don’t work like that. At Help-U-Sell we begin with a thorough analysis of the broker’s target market. We look at everything we can find about the market place, breaking it down to smaller and smaller units: zip codes, then neighborhoods, then carrier routes. Among other things, we’re looking for two significant details: seasonality and turnover rate. Turnover tells us where to target our advertising and seasonality tells us when. One of the keys to being successful as a marketing company is narrowing your focus. You want to target your prescious marketing budget to the group that is most likely to respond and use your service. the biggest bang for your buck. For example, you could target the 400 homes in a particular neighborhood where the turnover rate has been 6% for several years — which means that 24 homes will probably come on the market this year — and try to get , say: 20% of those. Running campaigns on several target neighborhoods at once can produce much better results than shotgunning your message to the world. Traditional agents put their new listing in a homes magazine and then breathe a sigh of relief because the seller will be happy for the next week or two. If a marketing company puts a listing in a homes magazine, they do it to generate leads and so they carefully track the results they achieve. Every time the phone rings in your office with a potential buyer or seller on the other end (or you get an email inquiry), you have to write it down, count it, keep track of it. Ideally you get a name, contact information and what caused them to call. But even if you never get beyond the fact that they are a buyer or seller, you keep track of how many times potential customers contacted your office. Source information is critical in evaluating your marketing program and making decisions about where to best spend your dollars. If you have an easy to use leads managment system, like the one we use at Help-U-Sell, you can look at every bit of marketing you’ve done and see how many leads each piece generated and how many commission dollars were eventually earned. Ultimately you know whether that homes magazine ad produced $5 for every dollar you spent or $50, or (gulp) no dollars. And until you know that you aren’t in a position to fine tune your market plan. I had the opportunity during my hiatus from Help-U-Sell (late ’05 – mid ’09) to work with a couple of well funded start-ups who were going to revolutionize the real estate business. It’s true, both companies were thinking ‘out-of-the-box;’ it’s just that it was the wrong box. Keller-Williams is often credited with starting this fad, though in truth, theirs is not a true MLM concept. They have ‘profit sharing,’ where agents who bring other agents in can be compensated with a share of the company profits . . . which is laughable when you consider how nearly impossible it is for a traditional real estate company to turn a real profit. I know, I know: I’m going to get blasted for that but the truth is: very few KW agents are making enough on their profit sharing to replace their personal production. Nobody is retiring to live on their residuals. I don’t see how in good conscience a person six people removed from the agent who did the transaction, who may not even know the agent involved, should be paid a dime. This person probably had nothing to do with bringing buyer and seller together and may not even have known that a transaction was in process until his paycheck arrived. If there’s enough commission in the transaction to pay an agent so far removed, then there’s just too much commission in the transaction! It’s all about recruiting, not about selling real estate. The approach is: recurit everyone breathing and eventually someone will luck out and sell their cousin a house and then we all get paid! There is no attempt to find the right person for the job and little done to build the recruit’s skill. Finally: THERE”S NOTHING IN IT FOR THE CONSUMER! Sorry to scream, but this really bugs me. Once again, it’s all about the agent. It’s just the same messed up agent oriented business model, this time on steroids. Really. I had conversations with both of the companies I worked with about this and the attitude was that the consumer was the agent’s responsibility. The agents would take care of the consumer. The company’s role is to help the agent recruit. In other words there is no consumer offering. There’s nothing special or even distinguishing here for the consumer. It’s not about them. (And how you build a business that’s not about the consumer is a mystery to me). Will MLM be a factor in real estate? Probably. The the idea of making money for nothing is way too appealing, especially in a market where everyone is working very hard and few are making a good living. But is this something the consumer is going to choose going forward? I don’t think so. To the consumer it just looks like more of the same: a new twist on an already tired model. My dad was a Broker. I guess that makes me an S.O.B. Son-of-a-Broker. Anyway, I remember the week he passed his first salesperson’s test. It was 1965 and he was so excited. Out came the ‘want-ads’ after dinner and he scanned the real estate section for an opportunity. Eureka! Ted Tamminga (I’m not kidding- that was his name), the Broker in Avondale Estates a few miles away was looking for a salesperson. My dad went to see him the next day. This is where things get interesting, because Ted, unlike the Brokers of today, was not recruiting my dad; he was looking for help. Forty-Five years ago, real estate brokers were community fixtures. The broker was the business and the business was the broker’s. If a broker took on a salesperson, it wasn’t for business expansion purposes. I mean: the broker wasn’t doing it because the new agent might bring new customers the broker didn’t already have. No. He hired agents because he had too much business to handle himself! Ted saw my dad as an apprentice, to whom he’d toss off the low probability prospects who required much of his time. By hiring him, he could take an afternoon off in the middle of the week to play golf. Dad got the left-overs and the hand-me-downs and was paid reasonably for the good work he did: 50%. Ted was quite a character. He had the biggest, longest, goldest Cadillac convertible I’d ever seen. He also had a collection of pastel colored polyester leisure suits that would make Johnny Carson jealous. But what I really remember about Ted was the sunglasses — always on — and the huge grinning shark smile. He was just gonna eat you up. By the time I’d gotten my license in 1976, my dad had done what good salespeople did. He’d developed his own legion of loyal former customers and, being too busy for any more of Ted’s hand-me-downs, opened his own office. I went to work for him. It was an interesting time in real estate. The franchises were just coming on the scene. Red Carpet was first and showed everyone it could be done. But the big gorilla was Century 21. We’d heard about the company that was taking over the business in California and we heard it was coming our way. When it arrived, we quickly jumped on-board. Why? They offered survival. We’d watched as some of the Ted Tammingas in our little universe realized that every time they hired an agent, their business got bigger. We’d watched as they added and added and their signs became more and more plentiful. Suddenly we were no longer the comfortable community real estate company. We were just the little guys and it was hard to compete with our more rapidly expanding local brokers. Century 21 offered a way for the little mom-and-pop brokers to unite under a common banner and appear to be even bigger than the big local independents. That was worth the fare for the first few years, but then it became clear that even under the Century 21 umbrella, the best rewards went to the biggest offices. The franchisor — in fact all real estate franchisors — realized that the most important thing they could do is to teach their franchisees how to recruit. That was big. The whole industry changed in a couple of years. 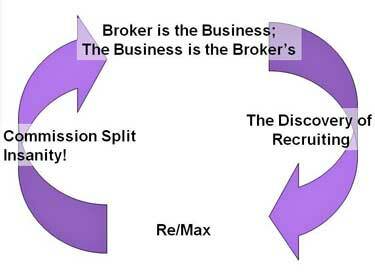 The broker bulls-eye shifted from doing an excellent job listing and selling real estate to recruiting as many agents as possible. It was the moment when brokers got out of the real estate business and into the recruiting business. And it worked beautifully . . . for awhile. Then, in the mid-80s, a tsunami washed over the industry and took it to its knees. The tsunami was Re/Max and its power was the 100% commission concept. Dave Liniger and his team realized that, since the bulls-eye was on recruiting agents, and since many agents are motivated almost entirely by money, if they could find a way to pay them more than anyone else, they’d get ’em all! And ya’ know what? It worked. Productive agents went to Re/Max in droves and there was little the traditional broker could do but stand in the door of his office and wave goodbye. By the end of the decade, the survivors had started monkeying with the model to cope in the new Re/Max universe. Graduating commission splits started to graduate higher and higher and broker profits sunk lower and lower. That was pretty much the story up to the market collapse in 2006. It got beyond crazy. In the best real estate market in history, most brokers were making no money. They had to throw it at their agents to keep them from going down the street. Here in San Diego, new agents with no experience at all were routinely offered 80% splits! While the industry was careening out of control there was a quiet little revolution brewing a few blocks off Main Street. A gentleman named Don Taylor started charging a set fee to market homes — and the fee was way less than a standard percentage based commission! — and he was getting his sellers to help by showing their own property and holding their own open houses. He carefully orchestrated a marketing program that kept the phones ringing with prospective buyers and at the end of the day was able to turn huge numbers of transactions with very little help, amass a legion of delighted customers, and realize a staggering profit. That was 30 years ago; and while the history of Help-U-Sell is a jagged line on a piece of graph paper –wild rises and horrendous crashes — the brand has endured. Remarkably, it’s changed very little from Don Taylor’s original vision. It still puts the consumer first and the broker in the center. It still delivers on the promise of seller savings over typical commission models. And it still delivers great profits to the broker. Today we are in real estate purgatory. We’re paying for the excesses of the first five years of this millennium. Agents have exited the business in droves (this is a good thing), and those who remain are working harder than I’ve ever seen agents work in my life. Prices are falling, interest rates are low, yet despite great government incentives, it’s hard for people to buy today. Financing requirements are tough, time-lines are longer and there’s lots of uncertainty around every corner. It’s a simmering soup of conflicting forces struggling to find a way out of the cauldron. Here’s a great business truth: you don’t make huge market share gains in the good times. The market share battle is won in times like these, times of crisis, times of chaos. As we emerge from this, the consumer is going to be making a choice about which real estate companies he wants to see in the future. He’s got lots of baggage. He remembers the huge commission expense that showed up on the HUD 1 last time he sold. He has gained access to much of the information brokers and agents kept from him in the past. And he’s learned from the banking business and the stock brokerage business and the travel business that he’s able to do a lot of things on his own, without the help of a knowledgeable expert. I don’t think he’s going to be choosing one of the Big Five (or Six or Seven — it doesn’t matter: they all have the same tired, agent oriented model). He’s going to be making a new choice, one that fits in the new world of empowered consumers. This is going to be fun!